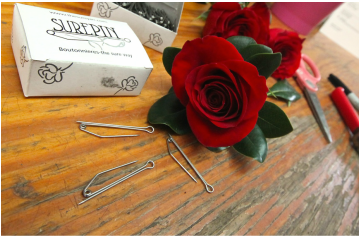 The Surepin®​ is a tool that makes pinning on a boutonnière/corsage easy for your customers. Thank you for visiting thesurepin.com. The Surepin® was created to enable you to insert a boutonnière​ into a lapel without stress or fuss. This innovation in floral pins came about as a solution to many bent and broken pins in addition to stained dresses and lapels from the pricks and pokes of the standard straight pin. Weddings, proms, graduations and all special events are such special times, but I can assure you, the part of attaching the boutonnière​ is one that most people want to forget. At a time when you want to look and be your best, you have a little pin and a large flower to somehow secure. By using The Surepin®, florists will be able to take their service one step further and clients will readily return for this task made simple. The Surepin®, for sure, will make pinning a boutonnière as it should be; pleasant, quick and picture perfect. "[The] Surepin® has made a tremendous boost to my business. We use this on all corsages. Prom mothers and brides are absolutely thrilled. Word of mouth kudos from them bring in new customers for the easy to use corsages! We can see the end results a lot of the times when we pick up rental items after an event and guess what..the bouts and corsages stay in place and look great after a day/evening long event. Love, love, love this product!" ​"Hi! I just wanted to tell you how great your Surepins® are. We got a box a couple weeks ago and used them for our first prom of the year. We received rave reviews! We took a chance and used them on ALL our bouts, including daisies and alstromeria! They worked great and had no complaints. Thanks! (Months later) I have to say I have had nothing but good reports and I have been using The Surepins®​ for everything. I have not had any problems with any types of flowers. All of the kids last year said the REALLY liked them and are hoping to have them again this year. In fact I am getting ready to gear up for prom and will call you for a couple of boxes……"
"Our customers love The Surepin®​. It is so much easier than using the regular straight pins. We show each customer how it works and it is great at keeping the flower straight on the lapel. It makes us stand out as innovative and forward thinking. It’s a little thing that makes life easier for our customers." "I bought Surepin at a show many years ago. I bought 2 boxes. I am in a very small town and found it was much easier for my prom customers and larger occasions for corsages and boutonnieres, to utilize Surepin. Their easy attachment for the consumer, recipient, and all involved made them a "no brainer". I have almost exhausted my supply and have looked at many wholesalers, in Maine and Massachusetts to Rhode Island, to purchase but couldn't find them. So I'm glad I googled, found you and placed my order. Thanks again!!! With shotgun casing boutonnieres in Oct to the multiple single carnations corsages and boutonnieres for a hospital event, my work will be much easier and my customers happy." "We have been using Surepins® for the last 3 years. We absolutely love how [much] easier they are to use and the amount of time in labor we save. Our customers love them and it has actually increased sales!"